A lot of the lights you will see on this website, and at my home, are controlled by a PC. The software is called Vixen, a great public domain application designed by K.C. Much of the hardware, controllers were either designed by me, or by friends over at DIYC. The software used to control my lights is called Vixen. Fancy decorating your home with thousands of Christmas lights? What about syncronising those lights to music? Or maybe even building your display with a range of DIY projects and collaborative ideas? You're not alone! 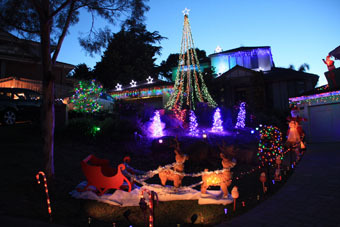 auschristmaslighting.com.au is home to a community of Christmas lighting enthusiasts who run or are considering to run a computerised lights display. Want to know more about automated Christmas lighting? drop over the DIYC and check out the ideas, hear what others are up to, and new projects. Christmas only comes but one time per year! What to do the rest of the year? rebuild a June 1944 Ford GPW jeep. Have a look at the project via the Tabs above. I am a member of the Victorian Military Vehicle Corps, and you can see my 'other' website. The lights and on and the people are being entertained. We turned on the lights from 1 December 2010 for this season, and they will be on until Midnight on the 1st of January 2011. The lights are sychronised to music, and you can hear the songs by tuning your car radio to FM 89.1. There are 70,000 lights on 256 channels across two houses. all of the show is controlled from a single PC running Vixen DIYC software. All of the display items are hand made; from the PC, to the controllers, to the decorations. Many of the light strings have been modified to work on 24 VDC, from their original 24 AC and intregral mulitfunction controller. The Megatree is 20 feet tall, and has 9600 lights, in 48 channels of Red, Green, Blue and White. The stars on the roof are made from 2 metres of 24 VDC LED lightrope, attached to a steel wireframe welded in the shape of a star. The main star on the roof is about 4 feet tall, and has 196 10 mm LEDs in three channels. You can comfortably see the Lights from many kilometers away! The show runs from around 8pm each nite until 12:30. If the weather is unsafe, we may have to limit the show timings, or shut down certain decorations to be safe. This year, we are collecting for the Lort Smith Animal Hospital. www.abbyEstablished in 1935, Lort Smith Animal Hospital is one of the largest Animal Hospitals in the world, providing quality care for over 100,000 lost, abandoned, mistreated and sick animals every year.